With the arrival of Israel’s Minister of Foreign Affairs, Tzipi Livni, to the NATO Ministerial Meeting on December 3, 2008, the NATO Council ratified the Individual Cooperation Programme (ICP), an agreement that expands the working relations between Israel and NATO in the fields of security and diplomacy. Thus the infiltration of Israel into the affairs of the European/American infrastructure has now been solidified. Is it any wonder then that both Europe and America have soft-pedaled the massacre of civilians in Gaza now being perpetrated by the Israeli military? “Due to Israel’s proven abilities, we are an indispensable ally in the global struggle against terrorism. Israel has become a leader in areas of military prowess in fighting terrorists who are no longer in uniform.” View Entire Story Here. HUNDREDS OF JEWS FROM NORTH AMERICA gathered in Jerusalem on November 23, 2008, to support the Israeli Defense Force (IDF). The North American Jews joined their brothers and sisters from Israel and Europe in a conference of the General Assembly of the United Jewish Communities (UJC) held at the International Convention Center located in Jerusalem. The Jewish participants promoted the idea of the IDF being “the army of world-wide Jewry.” Continuing the theme to unite Jewry under the banner of Israeli global militarism, the IDF published an article on their Web Site, entitled, The Army Of The Jewish People In Israel And Abroad. “There is no other army in the world like the Israeli army. Your influence and power in your societies abroad has made us the strongest army in the region. But no matter where we turn there is a threat. We are ready to respond to the threat in Gaza and we are ready to do it at the right time.” View Entire Story Here. Now that the IDF has found the “right time” to attack Gaza during the unsettled-transition period of the US presidency - on January 6, 2009, hundreds of Zionist Jews rallied for Israel in New York City. And as US Jewry cheers them on, “ready” indeed are the Israeli terrorists in uniform to engage in ethnic cleansing of the Palestinian civilians in Gaza. As we watch in horror of the massacre of innocent Palestinian children - “out of uniform” - thousands of even more Zionist Jews from around the world are celebrating Israel’s attack on Gaza. And Israel itself is celebrating their “coup” in the European-American military political theatre. I am taking a short break from our Russian Orthodox Christmas worship and fellowship to post this very important article on Israel’s infiltration into the infrastructure of the European/NATO/American scenario. The solidification of a “global Zionist miliatarism” is now complete and it is frightening. Let us pause for prayer and supplication to our Precious Saviour, the Lord Jesus Christ, Who came to bring “peace on earth, goodwill towards man.” You know, everybody, this is our ONLY hope. Brother Nathaneal, do you know what St. John Chrysoston said about jews?,He was a doctor of the Church(Catholic) born 347, died 407. Have you read “The Plot against the Church”? Just like the Catholic dominated NATO countries and the zionist controlled USA attacked the Serbian lands (Krajina and Serb Republic in Bosnia and Herzegovina) in 1995 and the Republic of Serbia in 1999; today the Isaelies are also with militarian terror attacking the Palestinian people! Why will a “chosen of G-d” convert to Islam? Perhaps to influence the Hamas, because Salvation comes ONLY trough Jesus Christ, so I guess SALVATION was not the purpose of changing religion but HATE. May the Peace of NewBorn KING be with us all! Today according to the Julian Calendar, established for liturgical unity by the Nicene Council of 325 AD, we celebrate along with the Nativity, “The Synaxis Of The God-Birthgiver, the “Theotokos.” The Synaxis of St John the Baptist is celebrated the day after Theophany, which will be in a about 13 days from now. Your link to the military site is broken and it keeps saying, “Connection Timed Out”. Looks like you’ve hit oil and sparked a fuse at the same time. God be with you, Br. N.
The Link is working now. But I had to go to the Montreal branch of the Israeli Ministry of Foreign Affairs for the link. The armies of The Beast (Anti-Christ Israel) are now complete, soon they will meet the armies of God, their future is foretold and their destiny is assured. May their godless carcasses burn in hell for all eternity. do you remember the first person who was saved and who he was?? Just think. I don’t think it is a very Christian thing to wish someone burn in hell, more so tell their destiny. Only Son of God can say things like that, and we are all people with our own faults, and will answer to God directly. We should never lose hope for ourselves and others. Its just I cannot read these kind of comments and not point out the Christian way. Evil breeds nothing but itself..by that I mean thoughts too..because the first step to a killing (war etc) is to de-humanize a person or group of people, which is an anti-Christian approach. Maybe if some Talmudists want us to burn in hell, aren’t they different from Eyes Wide Open comment in terms of mentality?? PC problem. When a pc freeze it’s often becaus the CPU, Central Processing Unit got overheated. It’s just like a car engine with out a fan, it boils. Your pc got no or a bad fan. What you do is that you tell your pc-guy that you want a really good fan. Never minde the cost of the fan, it’s a fraction of a state of the art pc. If that is the problem then you got your pc working for cheap money. If that is not the problem you just use the good fan in your next pc. All pc have a CPU fan, you have nothing to lose. It will take the pc-guy less than 15 minute to install the new fan. It’s no big deal to a pc-guy. A new state of the art pc. The ONLY thing you have to know if you are going to buy a new pc is the speed of the CPU. What you do is that you ask the pc-guy what is the latest CPU-speed on the marked. He will tell you that it’s 4, four GigaHertz. You do NoT want that and the reason is that six month from now you can buy the same CPU at half price. What you want is the second fastest CPU, or even the third fastest CPU there is on the marked. You can’t tell the difference. That, the CPU speed is all you have to care about. The CPU you want is an Intel. There are two kind of Intel CPU, a cheap and the best. You want the best, ie the expensive. All the reast in the pc-box has to fit the CPU and that is the reason why you don’t have to care about the rest. There are five cards in a pc-box: 1 CPU - 2 motherboard - 3 Hard disc (HD) - 4 graphic card and 5 sound card. All you have to care about is the CPU. If you got the money, get a fast and big Hard Disc. Same rule, get the second or third best - six month from now half price. My laptop is 2 GigaHertZ, 2 GHZ and 18 month old, a very good laptop at that time. I sold my old pc-box to my sister, CPU o,5 GHZ and bought year 2000 and still running. The latest CPU you can get is 4 GHZ. What you want is a Intel 3,5 or a 3,2 CPU. Don’t worry about the rest. 50 bucks is coming in the snail mail. 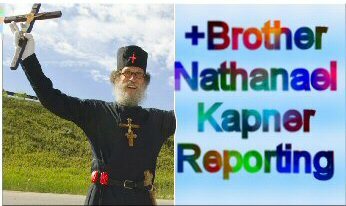 God Bless You Brother Nathaniel and all the brothers and sisters who visit this site. Maybe this time somebody should drop an atomic bomb on one of the Israeli cities? After seeing what happened in Gaza I no longer have any doubt that Israel is the Synagogue of Satan that Jesus talked about in Revelation 2:9 and 3:9. I tried to log onto Real Jew News at “Best Buy” tonight and found it was blocked as a “Hate Site” when what is more like “Hate” than what Israel is doing to Gaza right now? We aren’t dealing with real human beings here because they are taught to lie in the Kol Nidre that forgives them for lying in advance for the coming year. No wonder they hate the light. There’s no doubt that the “rockets” sent into Israel from Gaza was a trick by the Mossad. They are the liars and murders that Jesus talked about. Unfortunately as we Orthodox Christians know there was a great tragedy done in 1923 that created the “revised Julian calander” (to which I belong to). As I once asked my spiritual father as to the dogmatic diferences… he said not to worry the dogmas have not changed only the dates. He being an Athonite hieromonk, I find it an interesting answer. It is, none the less a true shame where some of us will hold a strict fast while our brothers and sisters feast at banquets. I wish Health, Spiritual Enlightenment and Advancement to all our brothers and sisters!!! I watched the speech of the future patriarch of Russia Holy Cyril. The Holy Liturgy was very well attended. Over 2000 people took part in it. Medvedev and his good wife Svetlana were also there. Putin and his good wife Ludmila were attending the Holy Liturgy in some small church outside Moscow. Holy Cyril spoke very emotionally and eloquently. He is very educated, with a PhD in Theology, and with new ideas about how to attract the young generation of Russia to the Holy Church. Holy Cyril also said that the money should result from the hard work of the people not a result of different schemes and financial operations.I think here Holy Cyril had in mind Madoff and people like him. Madoff I think is only the tip of the giant muddy iceberg$. I hope you had a nice time, celebrating Rojdestvo Hristovo. By the way, I sent you a small package with the money for the computer and some small presents for you. Something warm for your jogging and something else. I hope you will like them. I also was very disappointed to hear about the bad treatment and lack of respect given to you by some people in your community/town. If they do not change their rude and unacceptable behaviour toward you, they will have to deal with GOD’s punishment….. Pray for them. When they come for you how will you respond. Make no mistake they will come. The self appointed chosen people are just warming up. They are too chicken to come unless they are in overwhelming force armed to the teeth or in the dark of night. Dear Katerina, I only quote revelations, not my words but the words found in the bible. One verse applying to the situation in Palestine is Rev 3:9, open your eyes and have no qualms about despising satan and his ilk. This pact will make it far easier for Israel to attack European targets under the guise of Muslims. Near where I live Israelis are training with British tank forces, presumably teaching them the skills to put down civil unrest in the UK the way they do in the occupied territories. They taught British police how to deal with suspected suicide bombers, and shortly after Jean Charles De Menezes had his head blown off. We are heading into dark days. Then shortly after Jesus’ 2nd Coming, down from the sky will come the great hosts of Heaven with Jesus in the lead to destroy the Antichrist and his one-world empire in the awesome Battle of Armageddon. This great slaughter of the Antichrist and his armies will take place in and around the valley of Megiddo near Haifa in Israel. It will mark the end of man’s cruel rule on earth, as Jesus, the King of Kings and Lord of Lords, and His Heavenly forces forcibly take over the World to rule and reign and run it the way it should have been run if man had not disobeyed God and gone his own selfish way! Only one people are Anti-Christ, those who call Israel their home. Muslims revere christ as a prophet, so let no-one fool you that Ahmadinejad, Hugo Chavez or any other “person” is the antichrist, the antichrist is not a person but a people, a people who are anti-christ. I won’t argue with you but will repeat that to wish someone - a HUMAN - burn in hell is non-Christian. Period. You cannot just take a piece of Bible and divert it to use for one’s own anger. I’d suggest looking at the two main commandments! There is no excuse for hating a person. People are not devils!! They are people. Though he might work with them. But still they are people and if you are Christian, remember that how we judge others is how we will be judge. So if you wish someone to burn in hell forever, whats next?? It’s ok to point out mistakes but your comment is not about that. There is no excuse for hating people, and to use a New Testament for such justification is VERY wrong. Jews and blood sacrefices, Toaff, a jew. Brother Nath, just now i got news from the times of india that US & India are in talks, in London, on the issue of providing missile shield systems to help New Delhi face any nucler threat from Pakistan.is this an indicator that an another war is coming (to make israHELL safe)? Anti Spam is giving me a problem posting. We are in an awful mess. The evil has taken over and I thank God that I woke up in time to not vote for Obama. He is going to be more of the same, putting the power of America behind the wants of the terrorist state of Israel. He has said nothing about the bombing of innocent children in Gaza, a “war” based on more lies that the Arabs lobbed “rockets” into Israel when it was the Mossad that hit an abandoned road with a small rocket that looked like a joke. 700 Arabs killed and only 5 Israelis, 4 of them by their own “friendly fire!” Israel has been bombing schools, hospitals, ambulances and playgrounds. Such slaughter hasn’t happened since the Jewish Bolsheviks got the Polish to murder 58,000 Germans in a part of Germany that had been given to Poland by them after WWI. The photos of the bodies all over the fields and streets are staggering, and that’s why Hitler had to rush into what had become Poland to save his Germans. I can send you a photo of a large group of them to post because you can’t believe the extent of the crime unless you can see it. One of the Uk’s leadings banks has just rebranded and renamed itself ‘Aviva’…what does that tell you??? Katerina lives in a fantasy world..Jews are not the same as Christians, even their own critics will tell you otherwise…You’re obviously a sympathizer, Jewish or someone who is exploiting Christians in concert with Jews. Is Israel Really America’s Friend? Dear Katerina, I dont “wish” anything other than world peace, it clearly states in the bible that following the defeat of Satans Antichrist armies by the armies of GOD they will be thrown into the pit (HELL) and following that peace will reign for a thousand years. If you are a Christian as you claim, you should know these things or you should spent a bit more time reading your bible instead of critising others who have? Katerina, I urge you, and ALL Christians to read this…….the time is at hand where you must choose….are you wheat or are you chaff. There is no more sitting on the fence, the choices you make are possibly the most important in your life. Christ is born! I have a comment which might not be as most of you think but here it is I felt compeled to write about. My Appologies that it is not connected directly to the topic but to the comments bellow this again excellent assessment of the world situation by brother Nathaniel. I know that brother Nathaniel and most of you on this side have very warm feelings toward Mr. Putin and Mr. Medvedev. I agree with most of your writings but regarding these 2 men supposed orthodox christian beliefs especially Mr. Putin, I am still in doubt especially when both of them left my people bulgarian orthodox christians freezing to death dispite the contracts they have with us. It happens exactly during the birth of Christ our LORD. They seems to pay attention about the money and the disputes they have with the ukrainians. It is unexcusable to panish people who have nothing to do with your money disputes with other! the halt of gas continues. will see how long it will be and how many people will suffer in my country for that. already people are closing hospitals, schools daycares etc. No need to answer to me! I guess I would like to raise the awareness about the reality about the former communist block leaders including ours who are in the churches but there deads are different when you look them. I will never trust their motives especially when they are more for public relations and less care about the ordinary people. Let them who has ears to hear and those who have eyes to see. Does any of you still have questions on the so call holy book of the jews, TALMUD? It was Ukraine not Russia that cut of gas supplies to Europe. Russia cut supplies ONLY TO UKRAINE because it did not pay its 2008 debt it owned Gazprom. Part of the deal in the meeting between Ukrainian PM and PM Putin was that Ukraine would pay its 2008 debts it owns but would still pay below market price for gas and not increase the tariff for transporting gas through Ukraine. Worse they charged market price to there domestic customers in Ukraine. Ukraine cut of the pipeline supplies to Europe to put political pressure on Russia and avoid paying what it owes Russia in 2008. Russia said it would continue supplying gas to Europe as they are paying customers. George Soros is reported to be working behind the scenes and advised the Ukrainian government to cut off oil supplies to Europe. Rothschild s front man George Soros who also backs Barack Obama has been causing trouble Europe for more than 2 decades he helped install the current governments in Ukraine and Georgia through coloured revolutions, helped draft the economic policy and engineered the Asian stock market crash in 98 destroying the Russian economy during the 90’s, backing Bosnian and KLA terrorists in the Balkans against the Serbs and supporting causes from gay rights, legalised prostitution and drug legalisation. The Commandments have been broken by this place called Israel who proclaims it’s self chosen. It shall come to pass that this place will be most likely be judged by those on High. It matters not who they are, it is by their actions towards mankind which has sealed their fate. False power can only lead to false existence…and falsehood to mankind. All mankind is to be One, and not in chaos. Israel will fall, if not by mankind, then by mothernature, it will.